JEC from A to Z: Ducting…one of my most favorite product lines! I guess the clamp together and snap together products remind me of being a kid playing with tinker toys and erector sets only these products aren’t toys by any stretch of the imagination. They are heavy duty and they are HUGE! And because we serve so many industries, we make it our business to supply a wide variety of ductwork and accessories. If you handle the collection and removal of dust, fumes, mist, etc., you need ducting! Maybe you handle agricultural dust, carbon dust, cement, chemicals, food and grain, fly ash, milk powder, flour, diaper fluff, paint products, paper, petrochemicals, plastic, spices, sugar, salt, textile dust, wood dust, pharmaceuticals, metal dust, metal shavings and have to deal with not only dust but with chemical fumes, fume exhaust, condensation, oil mists, smoke, vehicle exhaust, welding fumes, etc. Some of the industries represented by our customers who regularly purchase ductwork and related products from us are aggregates, agriculture, automotive, boatbuilding, chemical, concrete, food processing, furniture, lime, metalworking, mining, paint, paper, plastics, powder, recycling, textiles, woodworking, and the processing of other dry bulk materials. We offer ductwork that is easy and fast to install, easy to clean out, has leak-tight laser welded seams, and is reusable – cutting installation and downtime! Some of our products clamp together without the need for welds, bolts, screws, flanges, special tools, precise measurements, or specialized skills and can also be taken apart easily for cleaning or reconfiguring due to floorplan changes. Some products are available in aluminum, stainless steel, or galvanized. Also available are leak-free systems, abrasion resistant linings, custom manifolds, duct packages, flex ducting, and a full complement of accessories making Jamieson Equipment Company the Complete Solution for your ducting needs! 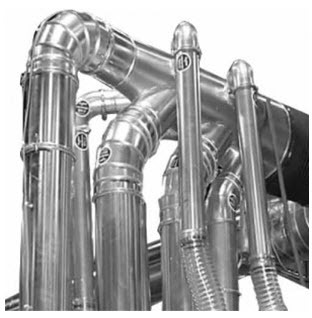 Click here to view all ducting products on our website. This entry was posted in Uncategorized and tagged Aggregates, agricultural dust, Agriculture, automotive, boatbuilding, carbon dust, Cement, chemical fumes, Chemicals, clamp together ducting, Concrete, condensation, diaper fluff, duct packages, ducting, ductwork, dust, flex ducting, Flour, Fly ash, Food, Food Processing, fumes exhaust, furniture, grain, Lime, metal dust, metal shavings, metalworking, milk powder, Mining, oil mists, paint, paint products, paper, petrochemicals, Pharmaceuticals, Plastic, powder, recycling, salt, smoke, spices, sugar, textile dust, Textiles, vehicle exhaust, welding fumes, wood dust, Woodworking. Bookmark the permalink.